Irrigation of green beans is crucial as the plants are made of soft tissue. Green beans can easily wilt to such an extent that yield losses are significant. So the successful cultivation of green beans depends on enough water throughout the growth season. In harsh climates such as in South Africa, successful green bean production requires easy access to an irrigation system. You must be able to cool the plant of during the hottest periods of the day. In rare cases will night irrigation be sufficient. In ideal farming conditions you must be able to switch on the irrigation in the middle of the day to control temperatures and allow the plant to cool itself down. That is what the water is for, not transporting nutrition alone. 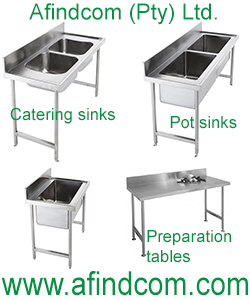 Higher marketable mass or total yield (kg) will be obtained. Combining excessive moisture on the wrong soil will reduce yields significantly. Too much moisture in high clay soils reduces oxygen content. Roots will start to die and plant will wilt since there are not enough roots to transport moisture to the leaves. A reduction in root mass will also reduce the amount of nutrients that can be transported to pods, thus lower yields. A soggy land will also prevent efficient harvesting and one often finds dirty pods that lower the grade of the marketable product. So not only will lower yields be obtained but lower profit margins will be realised reducing overall farm profit. Green beans have a short growth cycle and a very shallow root system. So they are very sensitive to moisture stress. For maximum yields, the moisture content of the soil should, throughout the growing season, be as near to field capacity as possible. 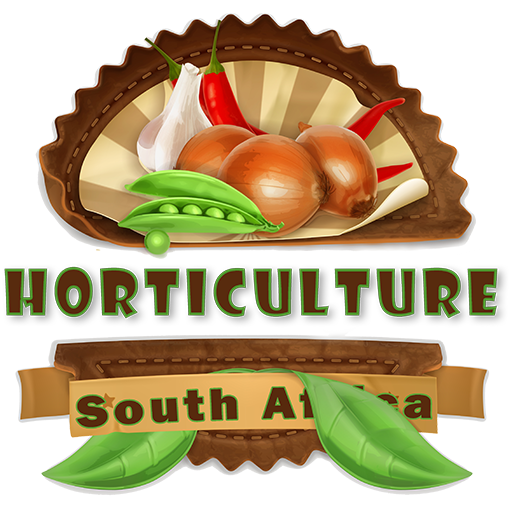 To get plants to optimum condition, strong vegetative growth before the flowering period and pod stages is essential. A shortage of water during flower and pod development can have a serious effect on yield, and adequate irrigation during these stages is therefor very important. Green beans have an effective root depth of 450 mm. This is the depth to which the plant extracts all nutrients and water for growth. Always take the root depth into account when planning irrigation schedules. Before planting, irrigate the full 450 mm depth. The amount of water applied and the volume per minute will depend on the soil type. A good rule of thumb is 50 mm per irrigation cycle. Saturating the soil with water before planting extends the next cycle a week after the plants emerged. Be careful on very sandy soils, vigilant testing every day is required. What is more important, look at the condition of your plants and read the signs of stress. The next 10 days 35 mm should be sufficient. Note, if the plants start to wilt too much, irrigate! Every 8-10 days apply 35 mm until flowering stage. From the flowering stage onward,, green beans are very sensitive to moisture deficiency and it will be necessary to irrigate at least 35 mm per week until the pods have been harvested. Once the pods are ready to harvest, don’t stop irrigating. This irrigation pattern or schedule may be used in normal conditions in the central area of South Africa where the yearly rainfall is about 400 mm. Since irrigation is not 100% efficient, provision should be made for about 450 mm. Rainfall is not included in these recommendations. If it rains, the amount should be taken into consideration. Water consumption is determined by the climatic conditions. In the very warm bushveld of northern and eastern South Africa, the water consumption will be higher than discussed. In the Highveld, lower values can be expected. Tensiometers and other high tech instruments can assist in the amount irrigated but nothing compares to knowing your plant. The plant will show you if it is happy. Experience, knowledge of you soil will be your best ally in determining how much to irrigate. Both types are equally successful with green bean production. However, the advantages of sprinkler over flood has been proven especially when water is scarce. Drip irrigation is also applied in commercial green bean production especially in areas where water is expensive. 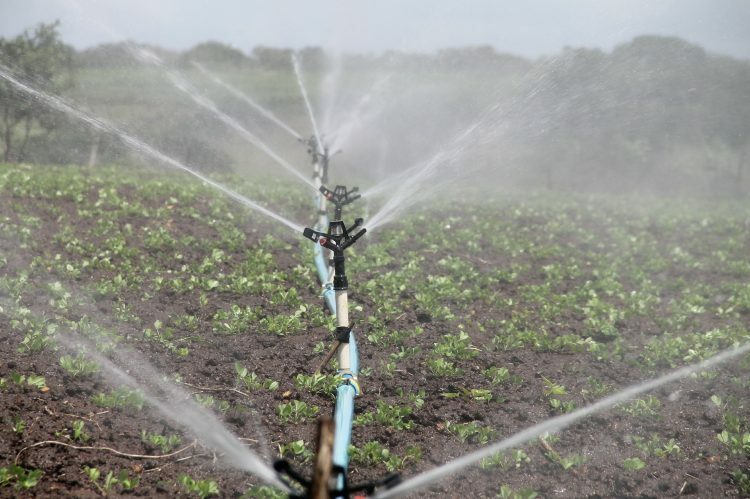 The precise application of water at each growth stage can increase total yields and easily pay for the infrastructure withing a couple of years. The advantage of sprinkler irrigation are found just before the beans emerge. Sprinkler irrigation wets the soil surface making it easy for cotyledon to penetrate the soil surface. 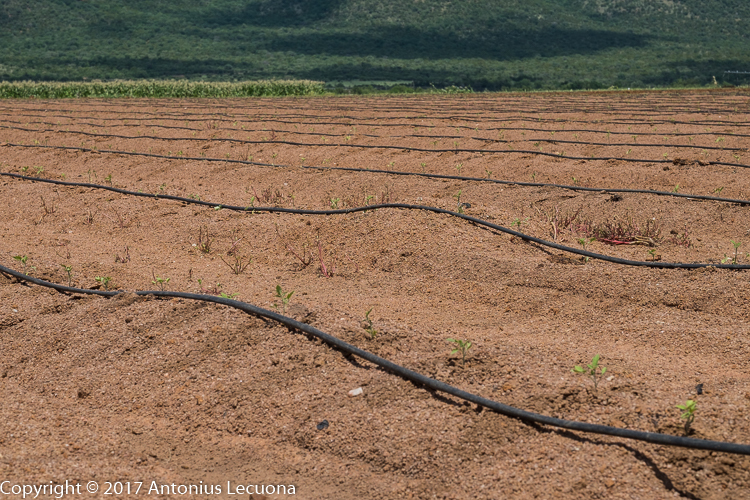 Drip irrigation is not always that accurate, or rather the point where the water drips out of the irrigation line is not necessary close to where the seed was sown. 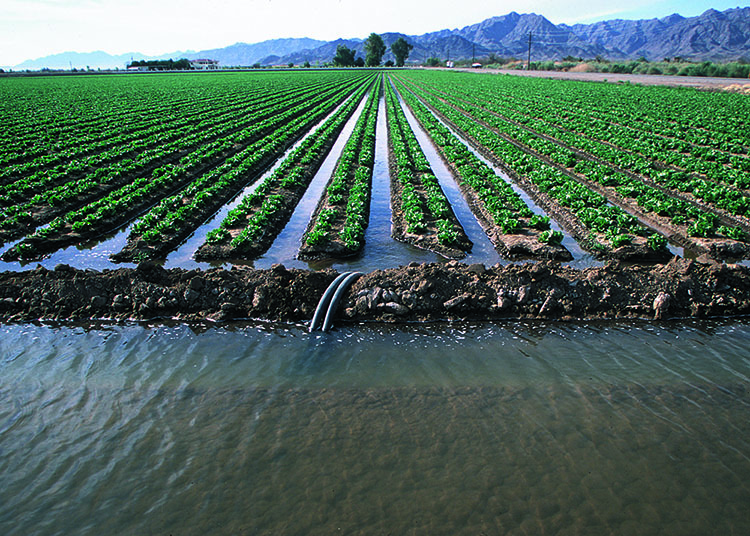 On very intense farming systems drip irrigation is used. The precise amount of water can be applied but don’t get too exited. Drip irrigation does have problems such as dripper blockages and you require a large amount of pipes. Commercial sprinkler irrigation on a drag line. Once enough water is applied, the whole line is manually shifted. This type of sprinkler irrigation is labour intensive but cost effective for smaller farmers.